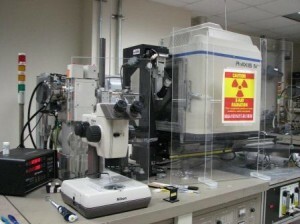 The multiuser macromolecular X-Ray crystallography Facility (XRF) in the Institute of Molecular Biophysics (IMB) at the Kasha Laboratory Building (KLB) provides access to home X-ray source for screening macromolecular crystals using copper rotating anode generator under cryo and ambient temperatures conditions. Home X-ray source crystal screening, collection, and processing of X-Ray diffraction data from macromolecular single crystals can be carried out using an automated R-Axis IV++ IP or marCCD165 detectors coupled a Rigaku RU-H3R or RU-H2R generators via Osmic Confocal Mirror systems. Oxford Cryostream Coolers are used to maintain the temperature of the crystals below ambient. It is one of the Core Facilities available to all the members of Structural Biology Program and is open to all the members of FSU. Since July 2010 a user fee structure has been instituted to recoup the consumable expenses of the Facility. The fee has recently been updated to reflect the current expenses of the facility.